A nerve block injection, also called a pain receptor block injection, is a minimally invasive procedure that can temporarily relieve joint or nerve pain. The cause of peripheral nerve or joint pain (arthritis, injury, degeneration) is not well understood. The procedure is used as a diagnostic test to determine if the pain is actually coming from the nerve or joint. The effects of a nerve/pain receptor block tend to be temporary and are rarely long term. If the block is successful, then a radiofrequency ablation may be recommended. What is a nerve / pain receptor block? Figure 1. 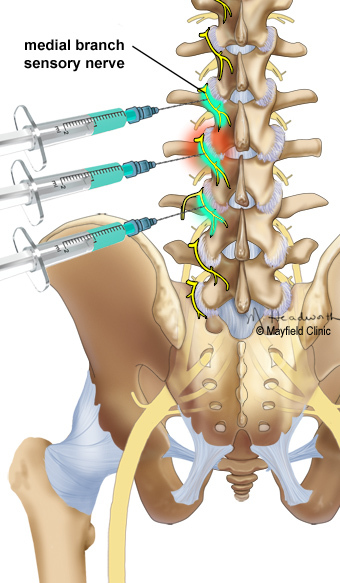 Anesthetic (green) is injected along the nerve to block pain receptors near the facet joint. A nerve block injection may be done one or two times or in conjunction with a steroid joint injection, depending on the physician and patient preference, as well as insurance requirements. If you have pain stemming from a joint or peripheral nerve, then you may benefit from a nerve block injection. Typically, the procedure is recommended for those who do not respond to other conservative treatments, such as oral anti-inflammatory medication, rest, or physical therapy. If a steroid joint injection confirms that the joint is the likely source of pain, then a diagnostic nerve block test may be recommended to determine if a radiofrequency ablation would provide more lasting pain relief. A nerve block injection is done using fluoroscopic (x-ray) guidance and should NOT be performed on people who have an infection, are pregnant, or have bleeding problems. The types of physicians who administer nerve block injections include physiatrists (PM&R), radiologists, anesthesiologists, neurologists, and surgeons. The doctor who will perform the procedure reviews your medical history and previous imaging studies to plan the best location for the injections. Be prepared to ask any questions you may have at this appointment. Patients who take aspirin or a blood thinning medication may need to stop taking it several days before the procedure. Discuss any medications with your doctors, including the one who prescribed the medication and the doctor who will perform the injection. The procedure is usually performed in an outpatient special procedures suite that has access to fluoroscopy. Make arrangements to have someone drive you to and from the office or outpatient center the day of the injection. At the time of the procedure, you will be asked to sign consent forms, list medications you are presently taking, and if you have any allergies to medication. The procedure may last 15-45 minutes, followed by a recovery period. The patient lies on an x-ray table. Local anesthetic is used to numb the treatment area. The patient experiences minimal discomfort throughout the procedure. The patient remains awake and aware during the procedure to provide feedback to the physician. A low dose sedative, such as Valium or Versed, is usually the only medication given for this procedure. With the aid of a fluoroscope (a special X-ray), the doctor directs a hollow needle through the skin and into the region responsible for pain. Fluoroscopy allows the doctor to watch the needle in real-time on the fluoroscope monitor to make sure that the needle goes to the desired location. Contrast material may be injected to confirm correct needle location. Some discomfort occurs, but patients typically feel more pressure than pain. Figure 2. 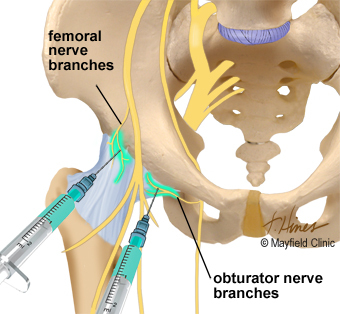 The anesthetic (green) is injected along a nerve to block the pain signals in the hip area. When the needle is in the correct position, the anesthetic is injected (Fig. 2). The needle is then removed. One or several blocks may be performed depending on the location of the pain. Most patients can walk around immediately after the procedure. After being monitored for a short time, you can usually leave the office or suite. Someone must drive you home. Typically patients resume full activity the next day. Soreness around the injection site may be relieved by using ice and taking a mild analgesic (Tylenol). You may be asked to perform activities that normally cause pain to determine if the procedure was effective. You may want to record your levels of pain during the next couple of hours ina diary. You may notice a slight increase in pain as the numbing medicine wears off. The physician will recommend further treatment based on the patient’s pain relief after the block. If the patient experiences marked pain relief immediately after the injection, then the block would be considered successful and indicate that the joint is the source of pain. In this case, a radiofrequency ablation may be recommended for longer-term pain relief. A radiofrequency ablation is a procedure that uses a radiofrequency current to deaden the nerves surrounding the joint and prevent pain signals from reaching the brain. A nerve block injection is a relatively safe procedure with minimal risk of complications. The complications reported in the literature include: temporary increase in nerve pain, neuritis, neuroma, localized numbness, infection, allergic reaction to medications used during the procedure, and/or lack of pain relief (in less than 30% of patients). If you have more questions, please contact the Mayfield Brain & Spine at 800-325-7787 or 513-221-1100.
fluoroscopy: an imaging device that uses x-ray or other radiation to view structures in the body in real time, or "live." Also called a C-arm. Nearly 80 percent of our spine patients are able to recover with nonsurgical treatment. Our physical medicine & rehabilitation (PM&R) experts help patients find relief from neck, back, and leg pain. They offer physical therapy, exercise, medication, massage, trigger point injections, and various other spinal injections (epidural steroid, facet, sacroiliac). Mayfield has two dedicated Pain Relief Suites, one at our Crestview Hills, Kentucky, office and the other at the Mayfield Spine Surgery Center in Norwood, Ohio. We also perform these services at most outpatient centers in the Greater Cincinnati area. Many of our patients have the option of same-day, outpatient spine procedures at our spine surgery center. Mayfield PM&R specialist Dr. Robert Whitten discusses facet joint pain and possible treatments, including joint injections, nerve block injections, and radiofrequency ablation.